Limited edition election themed packaging art! Designed by Someguy, also known as Brian Singer, an artist from San Francisco. Now get out and VOTE tomorrow! Yeah, just the right comparison in today's upcoming elections for the head of the state. A perfect personification that people or voters could relate to. 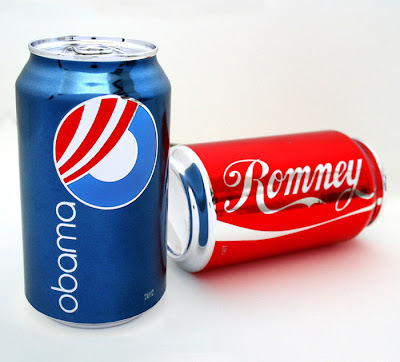 We know Coke and Pepsi share several things in common and they both taste great. But we all know that we have our own personal choice right here, and we just know who's better... or in this case, what's awesome for your taste buds! Someguy, you are a genius!